Don 2 has it locked up! 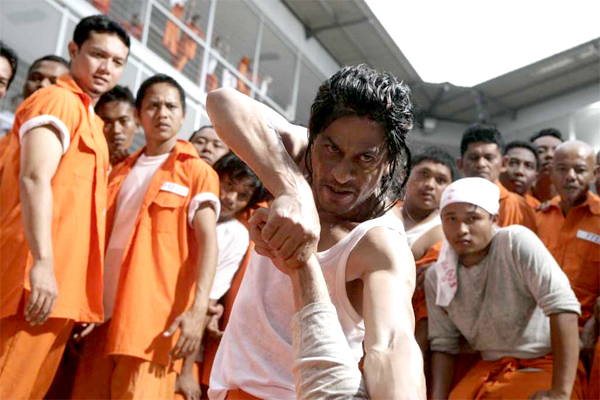 Shah Rukh Khan takes on the inmates of the jail and those who dared to question how he landed up behind the high walls. The actor shot with several local Malaysian artists for this sequence, which was physically taxing. The film was shot in a real prison with real prisoners behind the jail and a complete section of the prison block was made available to shoot. In order to avoid any hitches, special crew t-shirts were made to differentiate crewmembers from the prisoners as it was a high security zone. None of the crew members were allowed to carry their mobile phones and laptops. Produced by Ritesh Sidhwani and Farhan Akhtar, who is also the director of the flick, Don 2 is slated to break into screens on the 21st December 2011.